An attack on protesting Palestinians on March 30 by the Israeli military left 18 dead and thousands injured and constitutes mass murder and a blatant war crime, argues Palestinian human rights attorney Diana Buttu in an interview with Dennis J. Bernstein. The latest Israeli slaughter of Gazans falls into the category of shooting fish in a tank. Indeed, as tens of thousands of Gazans protested the longest occupation in modern history and demanded their historical Right to Return, last Friday, March 30, Israeli snipers raised their rifles repeatedly and, from behind a wide-buffer and an electrified fence, opened fire on the Palestinians. 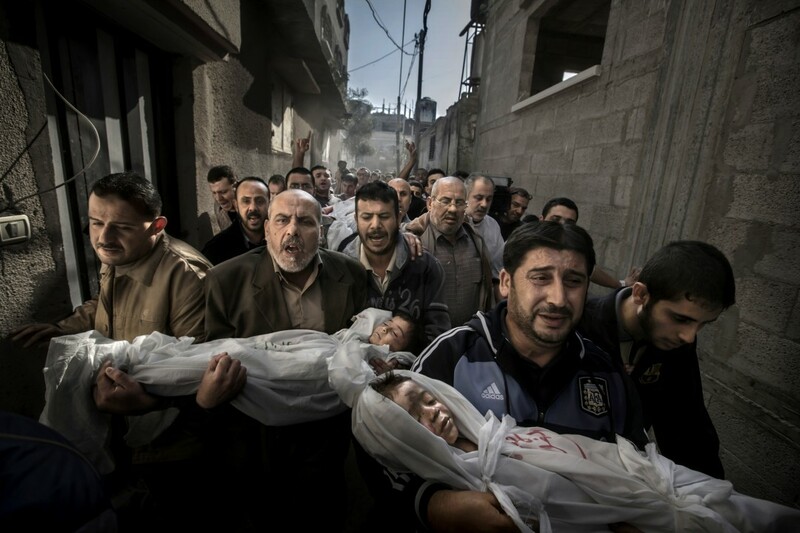 The World Press Photo of 2012, depicting a funeral procession in Palestine. The latest stats of killed and wounded from the so-called confrontation between Israeli sharp-shooters and Palestinians is at least 18 Palestinians killed and over 1,000 wounded. On the Israeli side, zero casualties. Zero! Diana Buttu is a Palestinian/Canadian lawyer based in the Occupied West Bank of Palestine. She is a former Palestinian negotiator. I spoke with her in Haifa on April 2nd, 2018. Dennis Bernstein: Maybe you could begin with your best information in terms of what happened. Diana Buttu: I can give you the rough numbers. 18 Palestinians are confirmed dead. Others are in very critical condition and unable to get the medical attention they need. Over [1,000] Palestinians were wounded. They are unable to receive treatment both because of the ongoing blockade of the Gaza Strip and because of the lack of electricity. Palestinian human rights organizations are calling for the wounded to receive treatment elsewhere, but so far the Israeli government has refused. Dennis Bernstein: What do we know about how this unfolded? I heard in an NPR report that this was not just a protest, that these were militants.